​Innoveer Solutions, acquired by Cloud Sherpas, was primarily engaged with CRM solutions on a global scale. Innoveer was an award-winning global CRM consulting firm with over 750 customers and 2,000 successful deployments under its belt. The company was founded in 1998 and provided a range of services, including discovery and planning, CRM technology selection, business process improvements, implementation, change management, and support focused on enterprise businesses in the Life Sciences, Insurance, Financial Services and Manufacturing sectors. 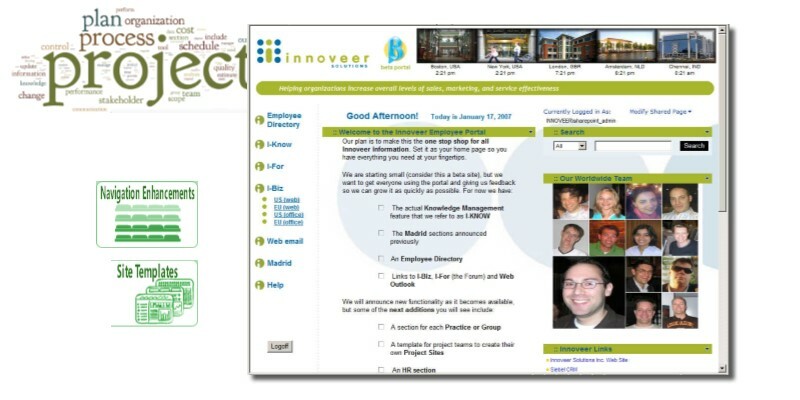 We designed and developed a custom Windows SharePoint Services 2007 intranet, for document management, and project support of offices worldwide. We also designed metadata, taxonomy, document categories, and searches. Additionally, we designed and deployed Knowledge Management site, advised and assisted on mass document migration, and did a very complete branding solution. They loved SharePoint, and they were eagerly putting documents into it and becoming SharePoint gurus, growing and living happily ever after, until they got so big they were acquired. We have worked with SharePoint since its first version and will be very happy to show you some examples of our work and provide ideas for how you can use it better within your company so contact us today!